So take the car, or get on a train, or book a flight to San Sebastián and come with us on a journey across an exceptional landscape. You won’t regret it! And we mustn’t forget the countless and charming villages that keep guard all along its 155 miles of seashore. Amongst so many cultural and landscape details, we must remember to make some space for its cuisine, praised all over the world! You want to discover the Basque Country? 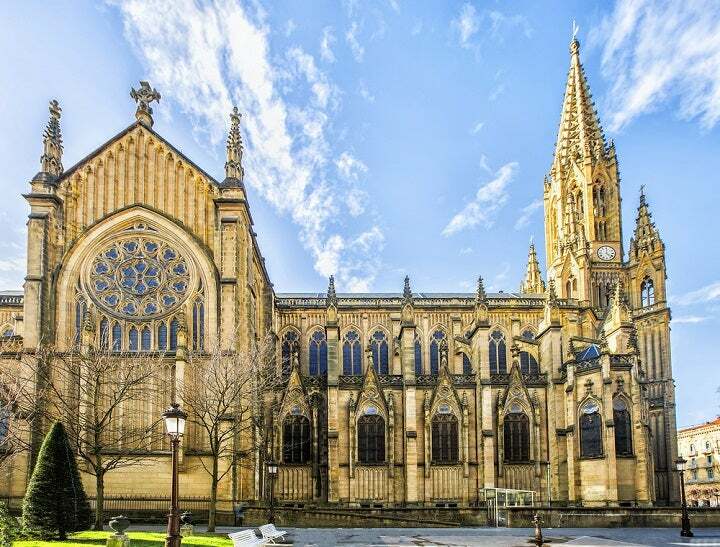 If you don’t mind, we were thinking of beginning our trip by visiting the majestic and dignified city of San Sebastián — Donostia in Basque — where many of the unique traits and wonders of the Basque Country are fused together. Towards the end of the 19th century it became a favourite summer vacation spot for the Spanish upper class, and as its architecture became more refined and its tourism grew, it eventually became a duplicate, in the Iberian Peninsula of the 20th century, of those elegant and sumptuous French cities from the Belle Époque. The highest strata of Spanish society loved the city so much that it was slowly transformed into one of the most captivating cities in the country. 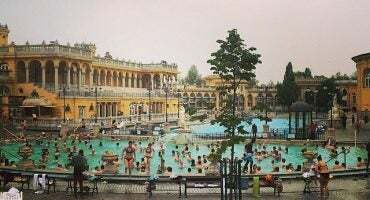 It is no wonder, then, that some of the most important cultural festivals in Europe are held there, like the San Sebastián International Film Festival or the San Sebastián Jazz Festival. 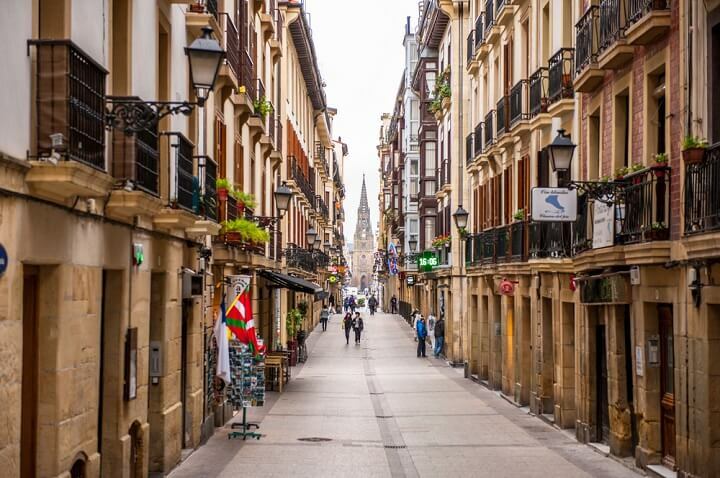 If you’re not in a rush to discover the basque country, San Sebastián is best enjoyed on foot. The Concha Promenade spreads across the city’s emblematic bay. 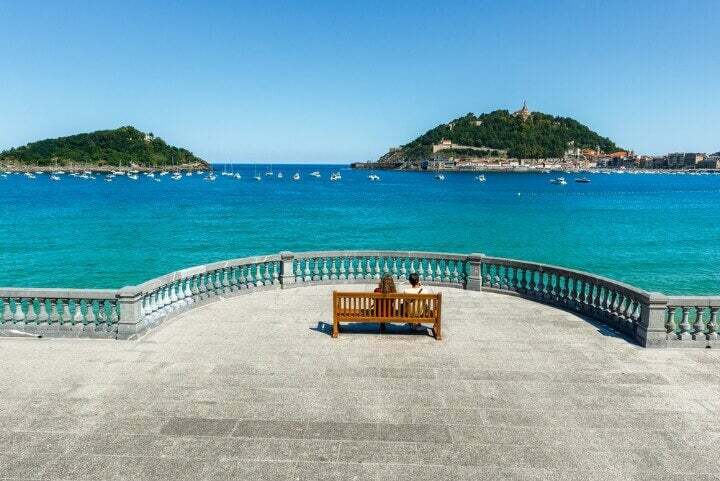 Tourists and Donostia locals walk side by side in a wide and relaxing pathway, and they gaze at the aristocratic and tasteful buildings on one side of the promenade — don’t miss the Miramar Palace or the Hotel Londres — and on the other side observe the beautiful beaches of La Concha and Ondaretta. 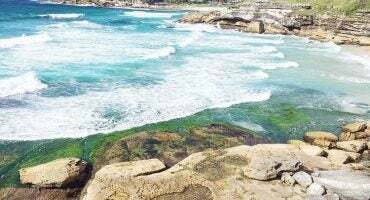 On the far side of this last beach you will find the spot most photographed in San Sebastián, where the Peine del Viento stands. 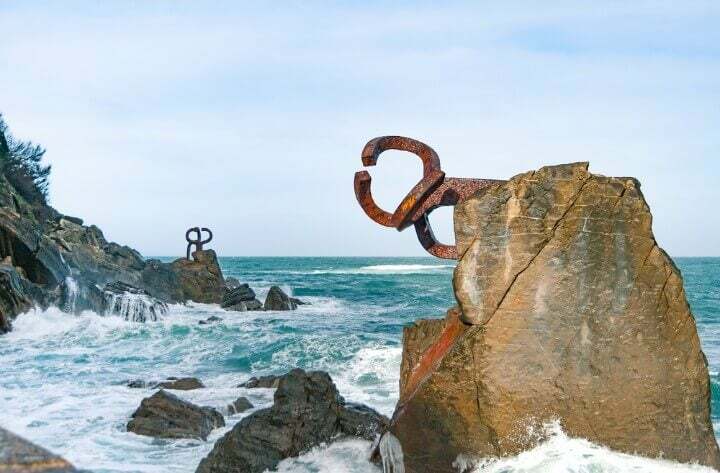 It is a sculpture made in 1976 by Eduardo Chillida and formed by three steel prongs that are embedded into the rocks and adorn, with their abstract beauty, the spellbinding landscape that is the Cantabrian sea. 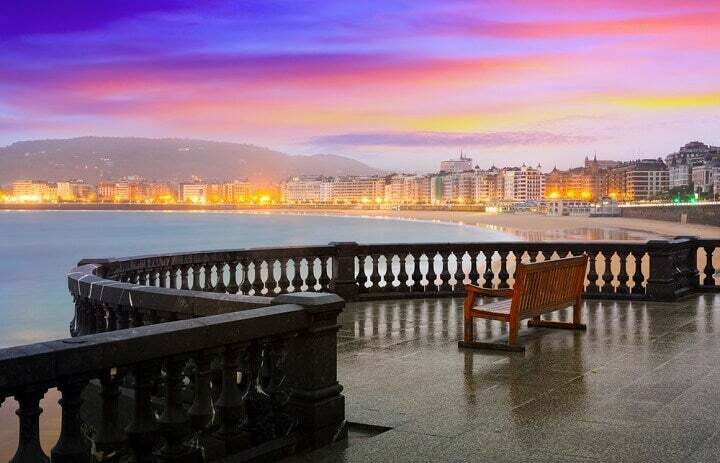 ✈️ Search flights to San Sebastián! Continuing onwards from Ondarreta, and just before we reach the Peine del Viento, you will see an enormous hill that, actually, is part of Donostia’s El Antiguo district, and on whose summit lies a pleasant surprise. Although, truth be told, there is no need to climb up to the peak if we want to see the first gift this mountain bestows us with: its wooden cable car from 1912, a charismatic mode of transport that will make you feel like you’re back in the past. And in a sense, you are, because on reaching the peak of Igueldo — a great spot for panoramic viewing of the city — you’ll find yourself in an amusement park that is rooted to the past, a unique place that opened in the same year as the cable car was built. 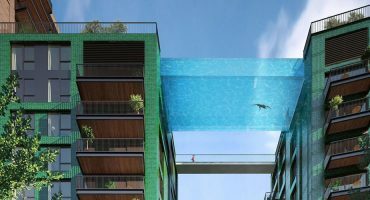 Flowing down Río Misterioso or enjoying the dizzying speeds of the Montaña Suiza, surrounded by the best views of the city, will all in all be (and here we can’t avoid the cliché) an unforgettable experience. 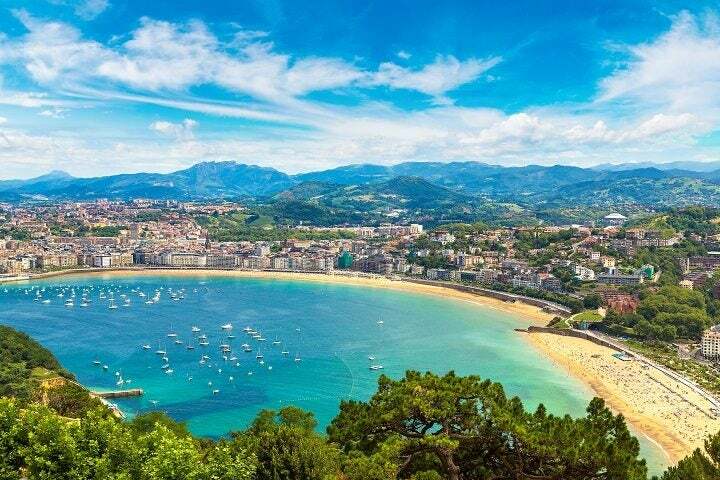 The coast is an important part of San Sebastián’s charisma, but not of all of it. Exploring the complex maze of streets of its historical centre will give you much more than aesthetic pleasure. Your sense of smell might also guide you to one of its many bars and taverns. The heart of Donostia is its cuisine. So you have to discover the basque country with your mouth as well! Cuisine of the highest standing. So much so, that for them eating is almost a religion. 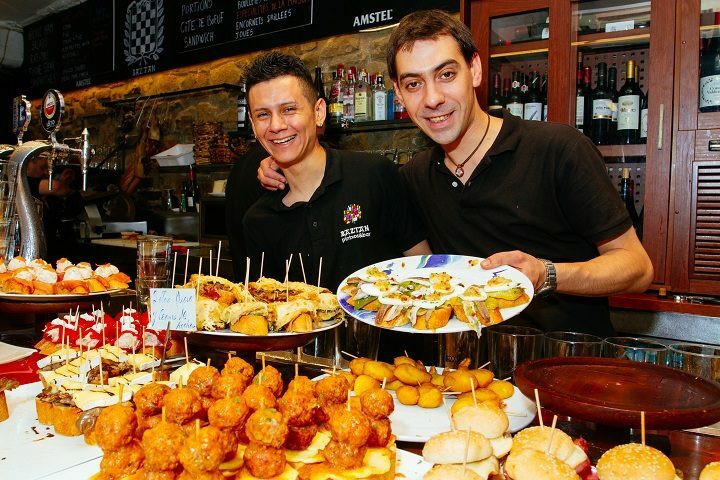 Their pubs are stations in one’s pilgrimage, and tourists and locals alike have almost a duty to taste those delicious pintxos they serve, together with a glass of their wine, usually white wine and known as txakoli. If we recommended only one of these pintxo taverns or restaurants we would be sadly ignoring countless others. But space is limited. If you stop in Gandarias, Nestor or Borda Berri you will have made a good choice. And after filling your belly with such a religious experience, what better way to relax than to visit the The Cathedral of the Good Shepherd, from the end of the 19th century. And if you prefer the kind of introspection that good art delivers, then the San Telmo Museum, dedicated to documenting the evolution of Basque society, is an excellent choice. A great follow-up would be to take a walk through Gros, another one of the city’s famous neighbourhoods and a centre of cuisine; or through Zurriola, a beach for surfers that is more hidden and has bigger waves, crowned by the magnificent Kursaal Congress Centre and Auditorium, designed by Rafael Moneo and employed each year by the Film Festival. 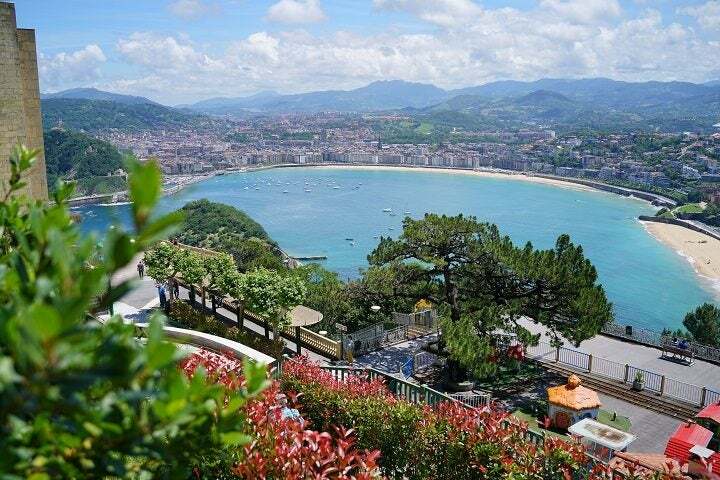 From there you can cross the Zurriola bridge and find two jewels from the Donostia Belle Époque: the Victoria Eugenia Theatre and the Maria Cristina Hotel. With Donostia still engraved in our memory, we continue on our journey in search of a city which has reinvented itself in the last two decades: Bilbao! This is mainly thanks to the Guggenheim Museum, opened in 1997, which in just 20 years has managed to become the city’s international symbol, one of the few museums in the world where its stunning architecture, designed by Frank Gehry, is more well known than the artworks it holds within. The arrival of this titanium giant really helped the city, which was already famous for its quality of life and cultural vibrancy. Many things make Bilbao a place one would want to live in: its beautiful estuary, its intricate historical centre and the fascinating mix between its 700-year-old history and the latest trends, and its cuisine (after all, this is the Basque Country we’re speaking of), with a cornucopia of delectable pintxo taverns. 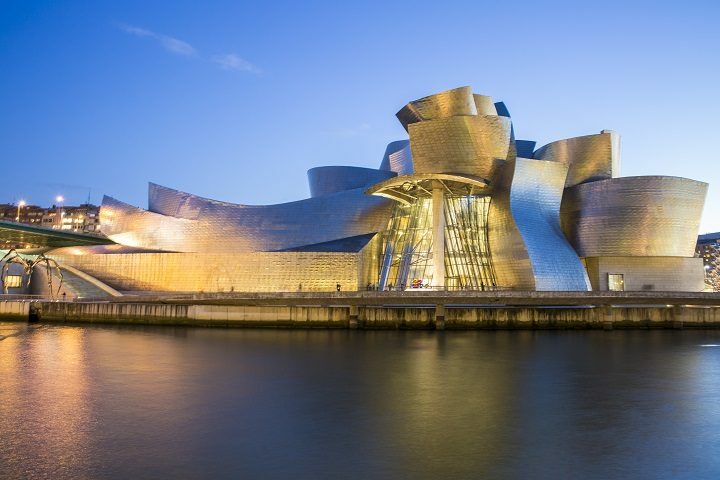 And if you’re into art, but the avant-garde isn’t your cup of tea, then don’t fret: the Bilbao Fine Arts Museum is one of the best you’ll find in the Iberian Peninsula. ✈️ Fly me to Bilbao! After Donostia and Bilbao, it would be unjust to forget about the seat of Basque government, Vitoria. Not just because of its administrative importance, but because it is an accessible, tiny city full of monuments that is often overlooked due to the fame of its big sisters. Its monuments have inspired art from all over the world, such as the Cathedral of Santa María, which Ken Follet (of whom, by the way, there is a statue at the gates) immortalized in his book The Pillars of the Earth. The historical centre will make you feel as if in a medieval city, and this is due to it still preserving its medieval plan. 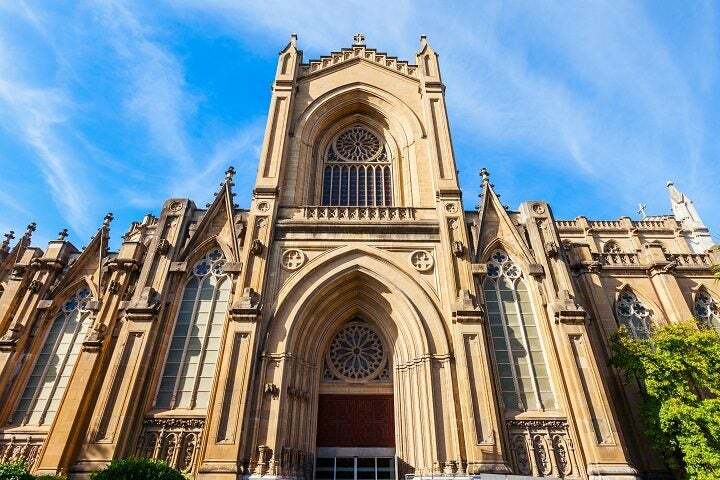 And if what you want is to enjoy the lush greenery that surrounds Vitoria, there’s no better plan than to wander down the 2-mile-long Paseo de Senda green walk, on whose end you’ll find a prize waiting for you: the adorable Basilica of San Prudencio de Armentia. ✈️ Search flights to Vitoria! 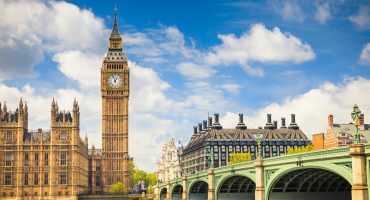 Save some days, or even just a few hours, to travel around the country’s incredible villages, surrounded by mountain, or even limited by the sea in many cases. There is such a variety on offer that it is, once again, unfair to only choose a few of its countless villages. If we were to limit ourselves to places that are close to the main cities, we could suggest Hondarribia—only 12 miles away from Donostia—a town that borders with Hendaye, in France. 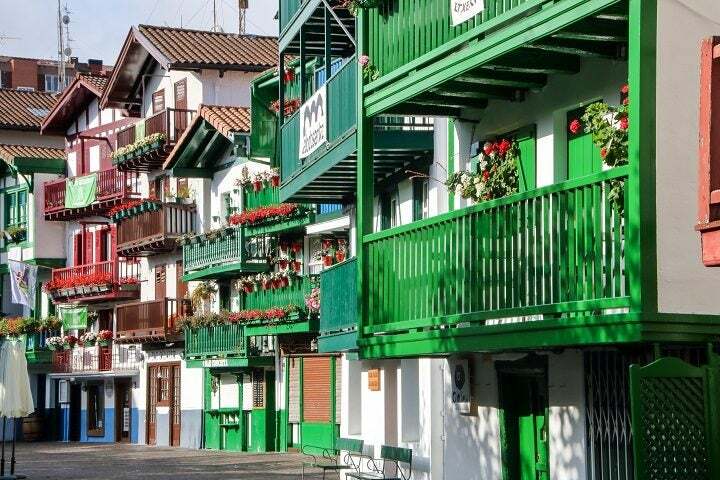 Hondarribia has a wide and pleasant beach and a fascinating historical centre. In the case of Bilbao, we could suggest Bermeo, 18 miles away from the city. It’s one of the most important fishing villages in the Cantabrian sea, and still retains its fishing traditions, since its ships and canning trade form the greater part of its economic activity. The walled town of Laguardia, 37 miles from Vitoria, will let you travel back in time through its narrow streets and enjoy its fabulous wine and cuisine. The most common way of travelling around the Basque Country without missing a single detail is to rent a car. You can do it easily by clicking on this link. For more information: Turismo de Euskadi.